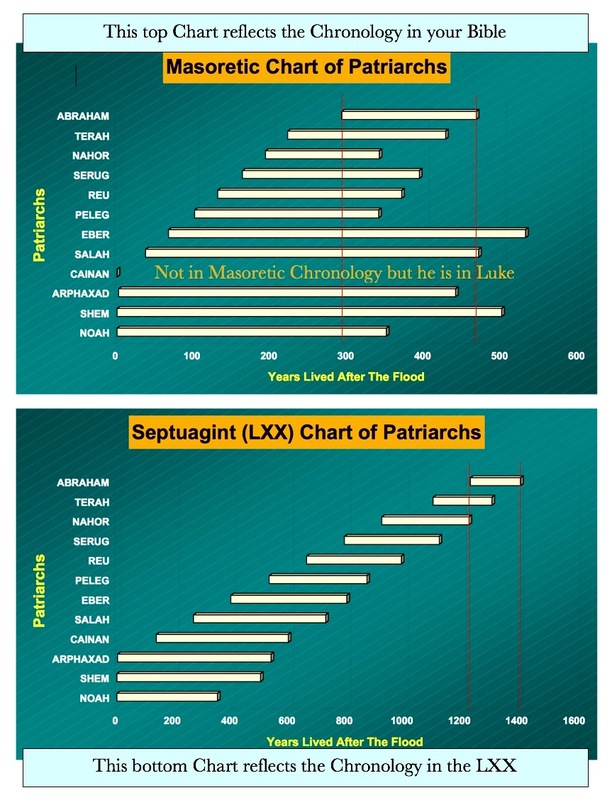 These two charts compare the only two biblical chronologies available. They are derived from two different sets of texts: the Hebrew Masoretic (800 to 1000 CE), and the Greek Septuagint (200 to 150 BCE). About one thousand years separates the two. They show significant differences. One or the other has to be wrong, if they are not both wrong. In these charts we only consider the time period that elapsed from the Biblical Flood of Noah to the lifespan of Abraham. According to calculations from the Masoretic, the Flood occurred roundabout 2,300 BCE. The same calculations from the Septuagint place the Flood 1,000 to 1,500 years earlier or about 3,600 BCE. Needless to say, secular archeologists do not agree with either sets of dates, but the Septuagint comes much closer to their conclusions. If the Flood occurred roundabout 2,300 BCE, according to the same chronology Abraham would have answered the call to leave Ur about 400 years after the Flood. We know that at the time of Abraham the pyramids of Egypt were already built. It does not appear possible for the population of the world to have grown sufficiently in 400 years to produce the Egyptian civilization and their incredible accomplishments. Let us calculate. It is estimated that the global population at the time of Jesus counted only 250 to 300 million people – or about a quarter of a Billion people. If, as the Masoretic suggests, the Flood occurred 2,300 years before the birth of Jesus, we would have to count in reverse to estimate the rate of population growth from the 8 people that came out of Noah’s Ark. We find that the population doubled 25 times in those 2,300 years, an approximate doubling of the population every 92 years. It does not take a genius to realize that if there were only 400 years between the Flood and the call of Abraham, the 8 people would have doubled about five times. This means that there were only 300 to 400 people on the entire planet when Abraham was called – not nearly enough time or population to build the pyramids or the Egyptian civilization. If we can add 1,500 years to that time period on the basis of the Septuagint, the world’s population could have reached 20 to 30 Million people at the time of Abraham; barely enough to produce a civilization as advanced as was Egypt; a country that probably counted 20 to 40% of the world’s total population, or less than 10 Million people living in Egypt at the time of Abraham. Since the world’s population reached 7 Billion on March 12, 2012, we can also calculate the rate of population growth since the beginning of the Common Era. It has doubled 27 times since then, which means that the world’s population doubled every 75 years for the past 2,000 years. However, most of the growth has occurred in the last two centuries. Since the year 1800, the world’s population has grown from One Billion to over Seven Billion. That period of time accounts for a doubling of the population every 35 to 40 years, though the trend has slowed in the last 40 years. It is clear that Scripture is not a treatise of chronology or archeology. There are numerous errors throughout. Scripture itself recognizes that fact. God is speaking when He said: “How can you say, ‘we are wise, for we have the law of the LORD,’ when actually the lying pen of the scribes has handled it falsely” (Jeremiah 8:8)? It is the work of imperfect humans. The most egregious error theologians have made is to make issues out of information unrelated with the Message God has been conveying to humans since Creation Week. On the other hand, while it is true that there are shortcomings in Scripture, the same can be said about science using the same simple math we have applied to demonstrate shortcomings in Scripture. Evolutionists estimate that humans began to roam the planet about 200,000 years ago. How can they explain that 2,000 years ago there were only 250,000,000 people on the planet? Even if humanity had doubled every 1,000 years, or ten times the slowest growth mentioned above, it would have taken only 31,000 years to reach the current population of the world. While it is true that there were large volcanic explosions and other cataclysms during that period of time, it is also true that a doubling of population every 1,000 years is preposterous – humanity would be extinct. Indeed, there are problems both with Scripture and the sciences. The only purpose of the Bible was to teach humanity the secret of a mentality that maintains life eternal while abandoning the mentality that leads to annihilation. Unfortunately religions have done a poor job of fulfilling God’s wish that led Him to accept the Cross to teach us the secret of eternal life. Jesus came to show us the way to the truth that gives this life (John 14:6), but are humans listening to His Message? Failure to change our mentality can only spell doom – let us give that some serious thought! Science is of little help in this regard.